Step1. Preheat oven to 200°C or 180°C fan-forced. Line a baking tray with baking paper and set aside. Using a sharp knife, slice each puff pastry sheet into 16 squares. Step 2. Wrap a square of pastry around each frankfurt and join pastry together with a drop of water. Arrange on the baking tray in a circle. Step 3. Mix together egg and milk and brush pastry all over with egg and milk mixture. Bake for 20 minutes. Step 4. Meanwhile, slice the capsicum at the top and bottom. Remove all seeds and slice to create a bow. 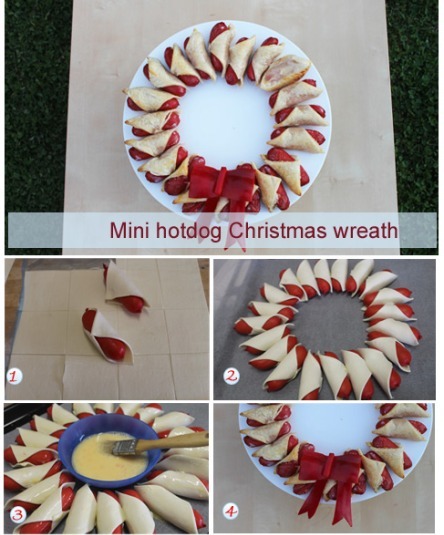 Slide your Christmas wreath onto a serving platter and place the bow at the bottom of the wreath. I like to serve this wreath with a trio of sauces. Tomato, plum and barbecue sauces complement this wreath well. By cutting each pastry sheet into 16 squares you will end up with 32 squares, which is more than you need. But one pastry sheet won’t give you enough squares! You could use the leftover squares to make palmiers or cheese twists.